(CNN) -- Team Columbia's impressive Giro d'Italia continued on Saturday as Belarussian Kanstantin Siutsou handed the American outfit their third stage victory when he won the 209km eighth leg from Morbegno to Bergamo. 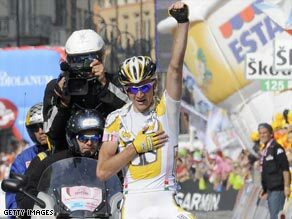 Siutsou crosses the line first to secure victory on Saturday's eighth stage of the Giro d'Italia. Siutsou broke clear with 15km remaining and held off the fast-finishing remains of the peloton to win the stage by 21 seconds. Siutsou's team-mate Edvald Boasson Hagen, who won Friday's seventh stage and finished second on Thursday's sixth stage, again showed an impressive finishing burst to come home second with race leader Danilo Di Luca snatching third place ahead of another Columbia rider, Michael Rogers. Di Luca collected an eight-second time bonus for finishing third to extend his overall advantage over Sweden's Thomas Lovkvist, who also rides for Columbia, to 13 seconds. Rogers lies third overall, 44 seconds behind. Siutsou's victory adds to Boasson Hagen's the day before and Columbia's win in the opening team time-trial, which put top sprinter Mark Cavendish into the race leader's pink jersey. Sunday's eighth stage, a pancake flat 165km of racing around 10 laps of a Milan city circuit, is likely to finish in a sprint finish which could see Cavendish claim Columbia's third successive stage victory. Meanwhile, Saturday's stage was marred by a nasty accident involving Spaniard Pedro Horrillo Munoz of the Rabobank team. Horillo was airlifted to hospital in Bergamo by helicopter after crashing down a ravine on the descent of the Culmine di San Pietro mountain about 70km into the stage. Early reports suggest Horillo Munoz has fractures in his upper leg, knee and vertebrae and is also suffering from broken ribs, punctured lungs and severe blood loss. He is expected to be kept in an induced coma for the next 24 hours.